Cancer patients who would typically have had only months to live are now in remission, thanks to the immune system’s very own T-cells. Scientists are now claiming “extraordinary” success with engineering immune cells to target a specific type of blood cancer in their early clinical trials. Notably, this is still early work. And as is true of all medical advancements, widespread implementation will take time. 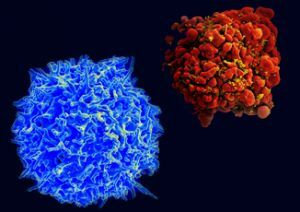 Moreover, T-cell therapy is dangerous, and typically only used as a last resort. But for those who have exhausted all options, for those who have no other hope, the early results are amazingly promising. To administer the T-cell therapy, doctors remove immune cells from patients, tagging them with “receptor” molecules that target a specific cancer. They then infuse the cells back in the body. This success rate is so “extraordinary” the scientists are even shocked. In one study, 94% of participants with acute lymphoblastic leukemia (ALL) saw symptoms vanish completely. Patients with other blood cancers had response rates greater than 80%, and more than half experienced complete remission. “These are in patients that have failed everything. Most of the patients in our trial would be projected to have two to five months to live,” said Riddell. Even more hopeful was researcher Chiara Bonini, who said she has not seen remission rates like those of recent trials in over 15 years. “This is really a revolution,” she said. Bonini, a haematologist at San Raffaele University in Milan, said that in another study researchers had tracked the presence of “memory” T-cells for two to 14 years after they had been introduced into cancer patients for whom bone marrow transplants had failed to work. During the study, 35 patients with ALL were treated with the modified T-cells. Out of these, 94% went into remission. In addition, more than 40 patients with lymphoma were also treated, with remission rates of more than 50%. In a group with non-Hodgkin’s lymphoma, there was evidence of diminished cancer symptoms in more than 80% of cases. Though these statistics are promising, T-cell therapy is often considered an option of last resort because reprogramming the immune system can be dangerous. Certain side effects can include cytokine release syndrome (sCRS) – and overload of defense cells. To that end, twenty patients suffered symptoms due to sCRS and two died during the trials. That said, the researchers noted that chemotherapy had failed in all the patients who participated. “There are reasons to be optimistic, there are reasons to be pessimistic,” said Riddell, of the Fred Hutchinson Cancer Research Center in Washington state. He added that the researchers believe that lowering the dose of T-cells can reduce the risk of side-effects. So far, these tests have only targeted certain blood cancers. The researchers acknowledged that more needs to be done to determine how long patients remain in remission, as cancer cells can sometimes hide unnoticed by the body’s defenses, or instead, overwhelm them and throw the immune system into overdrive.